Citrique Belge in Tienen (Belgium) is one of the largest citric acid producers in the world. As a part of their Triple P programme (People, Planet, Profit), Citrique Belge also devotes extra attention to the relationship with the environment. When a small number of people living in the vicinity pointed out an annoying noise that was sometimes produced by a number of cooling towers, Citrique Belge decided to investigate how this situation could be rectified. They turned to cooling tower specialist and fan manufacturer Almeco in Moeskroen for advice. Citrique Belge ultimately decided to replace the fans in the cooling towers with low-noise fans from Almeco. The five cooling towers of the FAB division at Citrique Belge are located on top of a production building at a height of 30 metres. An investigation showed that the tonal noise produced by the fans in these cooling towers could particularly be an inconvenience at night. Citrique Belge investigated a number of solutions including building a noise-damping wall, but ultimately decided to tackle the noise at the source. The fans in the cooling tower were replaced by a different type. Citrique Belge chose low-noise AVK fans. 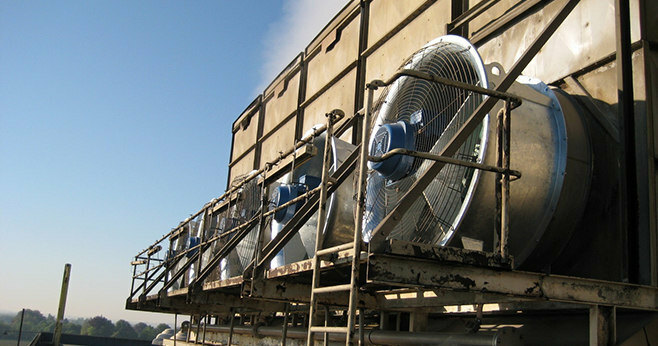 Besides being a fan manufacturer, Almeco’s activities also include replacing cooling towers with new cooling towers, the maintenance of existing cooling towers and the associated engineering. Almeco had already taken care of the maintenance of the cooling towers at Citrique Belge a number of times in the past. 59 dB(A). And this is for the five fans together. Power consumption amounts to 13 kW, in comparison with approximately 16 kW before. The fans are also fitted with frequency controllers for even more efficient operation in colder weather conditions.